The Assessment & Student Information Services Department compiles, processes, analyzes, and reports student, school, and district achievement, assessment, demographic, and other data to parents, the public, schools, district administrators, and the Board of Education. In addition, our department coordinates the administration and processing of all district, state, and federally-mandated assessments listed below; provides training and support for site test coordinators and principals; and maintains test security ensuring appropriate test administration and test preparation procedures are followed at all school sites. Desired Results Developmental Profile (DRDP); Basic Phonics Skills Test (BPST III); Evaluación de las destrezas fonéticas (BPST); Mathematics-Eureka End of Module Assessments in English & Spanish; Oral Reading Fluency (ORF); Fluidez en la Lectura (FLO); Writing Prompts; STAR Reading-AR; Scholastic Reading Inventory (SRI); and Scholastic Phonics Inventory (SPI). Shortly before school ended for the year, your child took part in the 2015–16 California Assessment of Student Performance and Progress (CAASPP), which includes the Smarter Balanced Summative Assessments for English language arts/literacy (ELA) and mathematics. These tests are based on California’s challenging academic standards, which include the ability to write clearly, think critically, and solve problems - the very skills needed to succeed in college and a 21st century career. These skills take time and effort to master, but our students will need them to succeed in the long run. CAASPP includes a number of assessments, but the most widely given are the Smarter Balanced Summative Assessments, which evaluate student progress on the California standards in mathematics and English language arts/literacy. On CAASPP, students’ scores fall into one of four achievement levels: standard exceeded, standard met, standard nearly met, and standard not met. The CAASPP tests for English language arts/literacy and mathematics were given to students in grades three through sixth. They consist of two parts.The first is an adaptive test taken on a computer that gives students different follow-up questions based on their answers, thereby providing a more refined picture of a student’s abilities. Second is a performance task that challenges students to apply their knowledge and skills to real-world problems. The two parts measure depth of understanding, writing, research, and problem-solving skills. Individual Student Reports (IRS) were mailed out on the week of August 12 - 17, 2016. Parents of students who participated in any of the CAASPP testing in ELA, Math and Science received score reports that include detailed information about their child's performance. If your child tested in 2015, you’ll notice that the score report presents two years of data - for 2015 and 2016 - which allows you to see your child’s progress over the last year.istrict and school site level summary reports are now available and can be viewed at the CDE's CAASPP website. Use this checklist to determine whether to keep your child home from school. SCESD 2016/17 Month 2 ADA (Average Daily Attendance). Great Job to all of our school sites. Special kudos to the school sites that are meeting the attendance state goal of 97%. Thank you all for making everyday count! 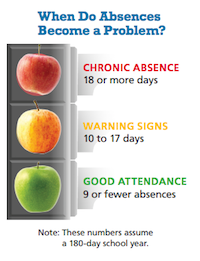 What is the AARC (Academic Attendance Recovery Coordinated) Program?